These Titanium 3mm multigem balls look stunning on barbells or labrets in may different body piercings including pierced eyebrows, lips, ears to name a few. They are made out of Grade 23 Titanium which is either available in the standard highly polished silver colour or anodised in Gold, Rose Gold, Bronze, Brown, Ice Blue, Blue, Yellow, Peach, Pink, Purple, 2 Tone, Teal or Green. 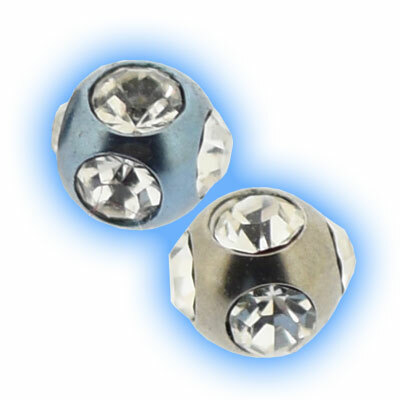 They will fit 1.2mm (16 gauge) externally threaded piercing jewellery and are available with Clear gems.